The King of Sweden, Carl XVI Gustaf arrived in Los Cabos to spend a week-long vacation at Solmar Hotel & Resorts. 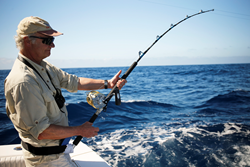 King Carl Gustaf practiced one of his lifelong hobbies, sport fishing, together with his entourage and met with local marine biologists and entrepreneurs to learn about the success story of Los Cabos combining fishing and tourism in a sustainable way. The King of Sweden, Carl XVI Gustaf arrived in Los Cabos on January 23 to spend a week-long vacation at Solmar Hotels & Resorts. King Carl Gustaf practiced one of his lifelong hobbies, sport fishing, together with his entourage. As part of his agenda, the King met with local marine biologists and entrepreneurs to learn about the success story of Los Cabos combining fishing and tourism in a sustainable way. His Majesty’s visit was inspired by the popular Swedish documentary, “The Old Man and the Sea - The Expedition,” where Solmar’s founder, the late Don Luis Bulnes, played a key role being a strong supporter of the project even during its early stages. The Martin Falklind documentary depicts an adventurous journey as two friends follow in the footsteps of Hemingway going Marlin fishing off a kayak. Recreating the narrative, Falklind, the filmmaker, accompanied the king in search of a marlin in the abounding waters of Los Cabos. “It’s an honor to welcome King Carl XVI Gustaf to Grand Solmar Land’s End Resort & Spa, a place built by a true visionary and pioneer of tourism in Los Cabos, Don Luis Bulnes,” said Ricardo Orozco, Solmar Hotel & Resorts' Vice President of Operations. King Carl Gustaf, the Honorary President for the World Wildlife Fund in Sweden, has long been interested and active in the long-term health of our oceans and conservation of marine life, with projects that include the protection of salmon and improving the potential of Sweden as a sport fishing nation. His Majesty looked to Los Cabos as an inspiration of a thriving tourism destination relying on the sea for its livelihood. One of the visit’s goals was taking back valuable knowledge to position sustainable sport fishing as a mean to create growth, employment and investment in his country- a goal similarly shared and achieved by Don Luis Bulnes. The Solmar legacy dates back to the 1950s when Don Luis, a young tuna cannery manager, embarked on an adventure of his own as he built the area’s first sport fishing fleet and later a five-property hotel collection, putting Cabo on the tourism map. Mr. Bulnes was also an advocate of sustainable fishing and founder of the Mexican Billfish Foundation. As part of his stay, King Carl Gustaf enjoyed a variety of fishing expeditions, from navigating in small pangas to fishing aboard a large big game boat with the namesake of Don Luis. During his stay, the King was delighted to catch a striped marlin, which was tagged and released. Taking advantage of prime whale watching season in Los Cabos, his Majesty also participated in a whale watching excursion. Another highlight of his trip was snorkeling with whale sharks in La Paz. For more information on Solmar Hotels & Resorts, visit: http://www.solmar.com. Located on Baja California's most exclusive and private beach, Solmar Hotels & Resorts offers guests privacy while still being able to enjoy the excitement of downtown Cabo San Lucas. The collection of five all-suite resorts offers guests the highest quality of service and hospitality. Within the past year, Playa Grande Resort and Spa as well as Solmar Resort were awarded the RCI Gold Grown Resort Award. Additionally, TripAdvisor recognized Grand Solmar Land's End Resort & Spa among TripAdvisor's Traveler's Choice Awards. The property was ranked 8th among the Top 25 Hotels in Mexico and received TripAdvisor's Certificate of Excellence. Grand Solmar Land's End Resort additionally ranked 5th among the "The Best Beachfront Hotels in Los Cabos" by USA Today. Grand Solmar Land's End Resort was also recognized by Travel + Leisure ranking 2nd among the World's Best Family Travel Hotels in Mexico, and 99th in the Top 100 World's Best Hotels. For more information about Solmar Hotels & Resorts, visit http://www.solmar.com, follow us on Twitter @SolmarResorts, Instagram and Pinterest and visit our Facebook page.